I've seen a lot of things in Mathews County, but this may be a first. Not the pretty marsh grasses. I'm talking about that boat. The boat that's pretending not to be a boat. The boat hiding underneath all that brush so instead of looking like a boat, it looks like a boat with brush on top. The boat that's serving as a duck blind. Of course, it could be a deer blind, a goose blind or a horsefly fiddler crab blind for all I know. The various hunting seasons, methods, and rules of engagement are lost on me except for the following bit of advice: During deer season do not go for a walk without mummifying wrapping yourself head to toe in neon orange while holding a great big sign that says, "I'm not a deer. Or a rabbit. Or a squirrel. Just because I am moving, don't assume I'd taste good served up from a crock pot during Sunday afternoon football. Thank you." But let's get back to the boat blind, shall we? Camouflaged boats are nothing new around here. Depending on the season you'll see camouflage everything, including cars, trucks, baby strollers, bicycles, ATVs, four-pronged walkers and wheelchairs. You name it, they can camo it. But someone went to great lengths and used a bit of ingenuity to come up with this one. This is the first time I've seen an old boat with a cabin repurposed as a blind. I wonder what it looks like on the inside. I was afraid to peek for fear of having my head blown off and being served from a crock pot during Sunday football. Not that anyone would do that around here. I just have a very vivid imagination. Oh, and I'm paranoid, have been ever since becoming a parent. For those of you who might be strangers to the hunting scene, below is a photo of a not-made-in-Mathews duck blind from a site called Duck Hunting Blind. Doesn't have nearly as much character as the Made in Mathews one, does it? I applaud the efforts of the person who decorated rigged up that boat. Just imagine what he could create for the Christmas parade which, by the way, is December 11. Although most people are probably halfway done with their Christmas shopping by now, I still have Easter candy lying around I'm still stuck in Thanksgiving mode and don't seem to be in any hurry to shift gears. In fact, I'm stuck in reverse. After spending two days preparing for Thanksgiving and another two days sleeping doing dishes and cleaning up, I didn't have time to read last Thursday's Gazette Journal until yesterday. "Editorial: In olden days our puritan forefathers were wont to regard Thanksgiving as almost a holy day. They rested and feasted and returned humble and sincere thanks to God for his manifold blessings. We wonder if in this Twentieth Century, when progress is the motto; when accumulation of wealth is the only ambition; and when mechanisms and machinery, invented by the genius of man, have supplanted the old time methods of doing things, we appreciate and are sufficiently thankful for the many advantages and multiple blessings we enjoy. It would seem that even in this age of turmoil the people could spare one day to return thanks as did their forebears in simple and earnest fashion. Then Thanksgiving Day would be more than a mere holiday and the people would have, in a slight degree only, discharged the debt they owe to the Allwise Creative Power that has guarded their foot steps safely through the years and rendered it possible for them to enjoy the privileges of this enlightened age." The references to the "mechanisms and machinery invented by the genius of man" make me wonder what the author might say to all the i-have-this and the you-tube-that. 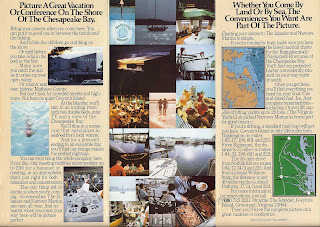 He'd probably say, along with my son, "Chesapeake Bay Woman, get with the program. Can you give us one good reason why you don't have an i-anything yet?" Speaking for CBW, she'd say, "Fear of change. I don't know." Speaking of the clash between past and present--and we may have been, however briefly---this weekend I spent a lot of time dawdling lounging in front of the TV with my children. One night, I forced them to watch the Wizard of Oz, after it dawned on me that they hadn't seen a non-3-D or computer-animated movie since ancient history in recent history. So while I ooooed and aaahhed at the costumes and the music and the colors and the hooked noses and the flying monkeys, they pretended to watch while doing who knows what on their i-gadgets. It's important to slow down. Marvel at the ingenuity and creativity of others. Revel in the present without worrying so much about the fact that it's less than a month until Christmas and you've done absolutely, positively nothing except boil the carcass of your Thanksgiving turkey to make soup, which as we know has nothing to do with preparing for Christmas and everything to do with merely preparing last night's dinner. Make a note to call an electrician so you can put up your artificial tree, since all the electrical sockets in the family room--except, thankfully, the one hooked up to the TV where you force your children to watch movies from the year 1939--are not working, and in order to have a properly functioning Christmas tree one theoretically needs a properly functioning electrical source for the lights. And one wonders why one doesn't have an i-anything, when one can barely get electricity/current to her house. My justification for avoiding the 21st century Christmas shopping or decorating over the extended weekend is now over. p.s. Have a great week, and thanks for letting me gripe ramble vent. From Aaron's Beach looking west. These are some random photos from a recent trip to Aaron's Beach. To keep me distracted from what I've been doing this weekend, namely decluttering an upstairs bedroom and identifying the source of a basement leak, please tell me the highlight of your weekend thus far. Unfortunately, you've already heard mine. Wayland Baptist Church was an inadvertent stop a few weeks ago. Although I took many pictures that day, the one above is probably my favorite. This headstone struggles to stand even though it would be supported by the church--if only it would lean back. Below is a window from the church. Next to the church is an older building just loaded with character--and a few of its own expressive windows. Barely visible in these photos is a hook above the door which must have held a light fixture. But that's just a guess, and we all know about CBW's guesswork. Chances are good her guess is wrong. I sure do wish this place could talk. Behind this church and its charismatic side building is a cemetery, parts of which are being overtaken by Mother Earth. I was spellbound by Wayland and grateful to have stumbled upon it on my way to who knows where wherever I was going. It's a beautiful church with lots of stories to be told, starting with all the unmarked graves in the back. 1. What kind of birds are these? 2. How did Wolf Trap Light, off in the background beyond these unidentified birds, get its name? 3. After two days of cooking and one entire day of non-stop eating, how many days of sleep does it take to fully and properly recover? 1. If you know the answer, and it's anything but sea gull, please leave it in the comments section. 2. To read a post on this lighthouse, click here. 3. No one may ever really know the answer since it depends on the individual, but speaking for myself I'd say three additional days are required. Somebody wake me up on Monday--thanks. Be thankful for each new challenge, because it will build your strength and character." Author Unknown, although Chesapeake Bay Woman so closely identifies with these words she is considering having them tattooed as a constant reminder. Except there are too many words and far too much pain involved, and she's not trying to build that much character, so never mind on the whole tattoo thing. Have a wonderful, safe, happy and relaxing Thanksgiving. Pretend for just one minute that the shot above is not lopsided and all the water isn't about to drain out of the lower left corner. Or, just ignore it and move along to the shot below that's slightly more balanced, which is a lot more than we can say for the photographer. Mathews has the rare privilege of being surrounded by water, and those of us who live here are fortunate that the county has set aside several beaches for public access. Although lacking the roaring ocean surf of the Outer Banks and the verve and vivacity of Virginia Beach, our beaches do have a lot to offer including horseflies, mosquitoes, fiddler crabs and stinging nettles. Unspoiled, undeveloped, and untouched by man (except for bare feet, of course), the county beaches are a great place to unwind, decompress and reconnect with nature. Last weekend I went to Aaron's Beach--twice. The weather was absolutely gorgeous and there was so much to see and take in. Like the bright red sponge below. Speaking of bright red, there were also whole, red chili peppers strewn all up and down the shoreline. Somebody must have upset the hot pepper cart over on the Eastern Shore, because a boatload of them washed ashore. Odd. Very odd. But we don't bat an eye at odd around here. We've come to project expect it. There's nothing quite like a warm day in November at the beach. Lots of salt air, bright sunshine, white sand and miles and miles of water for as far as the eye can see. And not a single fiddler crab or horsefly in sight. Just chili peppers. I'm very, very grateful for our beaches and our proximity to that vast expanse of water that is the bay, which brings me great peace, joy and tranquility without ever really trying. Every day, sometimes as many as six or more times, I drive past this tree as I leave or return home home from doing this or that. Often, it's very early in the morning as I set off for my 50+ mile drive to work Across The River, far, far away. Usually I'm not too happy about leaving home and commuting to work. But the alternative would mean that I had no job. With no job, I'm not sure how I'd be able to support our little existence here. Without an ability to support our little existence here, I'd miss many things, including the brilliant yellows this particular tree produces for us every single year. So when that early morning alarm ignites the fuse on my arsenal of complaints, I immediately stifle the overwhelming urge to complain (and believe me, it's overwhelming) and try, however difficult it may be, to focus on the good. Like the fact that I have a job. And this beautiful, exquisite tree. I am very, very grateful for all of it. One day last week before leaving for work, I glanced out the back door and saw this little reminder of why I could never, ever live in a city again. I am very thankful to live in the house I grew up in (before moving away to college and then to Northern Virginia [shudder]). This wouldn't be possible if not for my parents, who gave me the property after they moved next door into my grandparents' house. Now my children are able to experience the wonders of discovering fiddler crabs in the garage growing up in a rural area with the water just a few steps from the house. This week is Thanksgiving, and there is so much for which I am grateful, starting with this view and my parents. p.s. I am also very, very, very, thankful for paid vacation days, one of which I am taking tomorrow to spend with my daughter, who is off from school this week. Yesterday, in between errands, I managed to sneek a peek through some old windows that were basking in the morning light. This structure, located just down the Woman's Club Road, is chock-a-block full of windows just begging and screaming to be photographed. When I heard all their pleas, I pulled over and did exactly as they asked. The one below might be my favorite. Even after zooming out (or is it dezooming? unzooming? dezumbafying? Whatever it's called when you press the button to zoom back) I still love this window and the shadow it casts on the wood. Maybe the shot below is my favorite. I love how the vine, almost barren but still supporting a few leaves, frames the window; how the window is simultaneously dark, empty yet reflective; how the wood panels cling to their original life of red paint even though time is stripping away all their color. I'd name this photo Life and Death. Do they pay money for analyzing photos that had no meaning ever when they were taken? Because I'm pretty sure I could read meaning into a Tic Tac (based on color, flavor, position in the dispenser, circumstances under which said Tic Tac was sampled, and my mood that particular day) whether there was any intended meaning or not. All day long. To put these windows into context, below is a dezumbafied shot a shot of the same windows from farther back. Is there anyone reading who can tell me what this building used to be? What is it called when you un-zoom the camera lens? What is it called when you once could write a college-level essay in another language but now you can't even write in your native language without sounding like a first grade primer? Once again we find ourselves saying hello to Thursday, which is the day of the week where we pray for Friday to hurry up and arrive, for Pete's sake we share three things, whatever we want, anything at all. 1. Because it's been a month of Sundays since I've been out shooting local scenes, I decided to review photos from the past couple of Novembers. This one, likely taken at Bethel Beach, is from November 2008, my first year of blogging. It isn't the greatest shot by any stretch of the imagination, but there simply has been no time to take any new ones, and I'm desperate. a) Sit down and stare at the computer screen with absolutely no idea--no plan whatsoever--what the topic will be. b.) Peruse photos, find one that for whatever reason strikes a chord with me. c) Write about it for a bit and then wander off into the wilderness that comprises the inner workings of my brain. d) Never really talk about one particular thing, just flit from one odd topic to another. e) Conclude by trying to wrap it all together, usually with something completely unrelated to that initial inspirational photograph. f) Press the "Publish Post" button and wonder a whole lot of things, including where it all came from,what planet I came from and why anyone would want to read it. 3a. One week from today is Thanksgiving, which means one week from today may as well be Christmas since they've been shoving that down our throats sneaking it in on us since October. I'm not prepared for either one and just about flew into a conniption today when a coworker said he'd already completed all his Christmas shopping except for the couple of things he still had to pick up for his wife. 3b. Stifling the urge to cause serious bodily harm to this individual, not to mention my career, I suggested he change the subject, since some of us who are hosting Thanksgiving haven't even purchased the first item for that joyous occasion, never mind had the time to consider what is happening over a month from now for Christmas. So, that's all I have. Angst over lack of fresh photos. A strong desire to get out this weekend and take new ones. Anxiety over Thanksgiving, and dread over Christmas. Depression over the dark, dreary evenings and an ardent desire to move to Bora Bora. The End. Now it's your turn. Please tell us what's going on in your world, although if you celebrate Christmas and have already done your shopping, I beg you not to tell us. My coronary arteries thank you in advance. In spite of what the sign above suggests, this is Haynes Cemetery, not Aynes Cemetery. The photographer was more intrigued by the swirly design above the letters than the letters themselves, although they too have some degree of character and charm, as far as letters go. 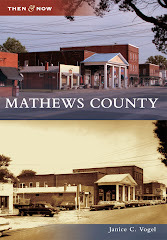 Haynes Cemetery sits across from Mathews Chapel in the Blakes vicinity. During my research at the Gazette Journal's library, I came across a folder that referenced a fairground and a one-room schoolhouse in the Blakes area. I could have sworn I read that the schoolhouse was the little white house at the end of the road that divides this cemetery and the church. But please do not quote me on that or anything, because the precious little amount of focus mustered from the recesses of my addled brain is tending to things like swirls and butterflies and blue skies rather than facts, figures, letters and details. And below, even when trying to include the letters, they rebel against me. It still looks like Aynes. Cemeteries have always fascinated me. I love to wander around and soak everything in: the names, the dates, the shapes of the headstones. The flowers or other offerings left by the living. The snippets of information attempting to capture a person's essence in one or two brief lines. I wonder who the person was, what they looked like, who their friends were, what they liked doing and what their special talent or gift was. Did they accomplish their dreams? Were they happy or sad? Did they have a deep, dark secret? Did they have any regrets? I linger over the graves of infants and children. I marvel at those who lived long lives and long to know their secret. My sisters and I played in Smithers Cemetery growing up on Queens Creek. Rather than viewing it as some somber, morbid place, we just looked at it as another adventure. A change of scenery, something different. Something mysterious. And I suppose that's the best way to look at anything related to change--or the end of life. It's just another adventure. Anyway, my point is not that I'm looking forward to death as some sort of adventure, because I'm really not anywhere close to being done with the adventure that is my life. My bucket overfloweth with lists of things I still want to do. Rather, my point is I've already forgotten what my point is cemeteries can be works of art and places of enjoyment when viewed through the right lens. This photo is similar to some I took at Pear Tree Cemetery, another of my favorite places. Click here and also here to see those photos. One of the unintended benefits of the sewer line project in Mathews is this photo op. One night on the ride home from ________________(fill in the blank, it's irrelevant, though chances are good it was Gloucester and a middle school sporting event was involved), the VDOT crew had us stopped in the middle of the road, waiting impatiently patiently for the left-hand lane of traffic to come through. Just as I considered the long-term repercussions of committing a felony due to the frustration of waiting in all this traffic that's not supposed to happen in Mathews, I remembered that my camera was in the back seat. Sometimes a minor inconvenience is really a great opportunity. This was the finish line at Saturday's state cross country track meet at The Plains, Virginia. Both Mathews teams came in fourth in the state, and freshman Emily Brown came in 12th overall for the girls. It was also a long day of driving. As much as I look forward to getting away, even for a day, it's always nice to return home. Signs like the one below can be a welcome sight after several hundred miles on the road. Except this particular one can be a minor irritation as well. You see, technically this sign is in Mathews already, so Mathews isn't really nine miles away. The Court House, or village area, is nine miles away. A simple "C.H." on the end of that word would make things right. It's a minor technicality, especially coming from someone with the attention span of a hummingbird who routinely makes blatant errors herself, but I felt compelled to point this out. 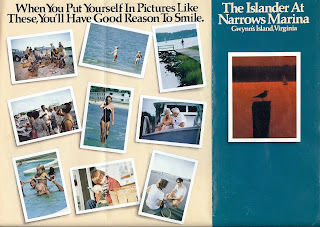 As long as we're on the topic of irritating signs, and we were--however unintentionally--one of the signs for Gwynn's Island says Gwynn Island. In all my years on this planet, I've never heard one soul call it Gwynn Island. It's Gwynn's. For those of you irritated at my straying off topic, I beg you to tell me what the topic was. The state track meet? The drive? Signs that are messed up? Irritation and aggravation? Hummingbirds? After a long day of driving, it was good to come home, even if that home was a mess and the overgrown rose bush at the front door tried to strangle me as I ascended the steps. Completely unrelated to any of the above except for the part about coming home, this is a reminder that the dogs currently housed in the overflow building of the Humane Society in Gloucester are in dire need of a foster or permanent home. The only place they know as home will close at the end of this month. If you're interested but are not in the local area, we can arrange to have the dog delivered to you. Below are two of the many in need. Click here to learn more about Felix. Click here to read more about Butch. Click here to view some of the photos from Saturday's cross country meet. Click here if you're tired of hearing me say click here. Last but not least, I read on Facebook have it on good authority that today Mathews Mark is celebrating a birthday. He hasn't been around for a while, but just in case he's reading I wanted to wish him a very happy birthday. Yesterday I drove over 300 miles round trip to attend (and photograph) the state cross country meet. On the way home, the Piankatank River sunset beckoned. After snapping a few photos, I realized how tired I was what a long day it had been and zzzzzzzzzzzzzzzzzzzzzt. 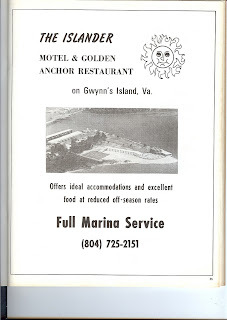 The other day while rifling through a box of memories, I stumbled upon this brochure for the Islander motel, marina and restaurant from back in its heyday. Click on the images (above and below) to enlarge them. See that naive girl in the middle (above) pretending to tuck her hair behind her ear? That's a young Chesapeake Bay Woman, circa 1981, strolling through the shallow waters that hug the shoreline just beyond the pool area. CBW spent many happy summers at that pool and became fast friends with Charles the lifeguard, who was the owners' nephew. One day, Charles told her to follow That Man With the Camera down to the beach to take some pictures. Without asking any questions, CBW dutifully obliged. After asking her to sign some paperwork, The Man With the Camera told her to walk around pretending to do this or that. When he insisted she pretend to tuck her hair behind her ear, CBW could hardly pretend not to laugh. Nobody would ever walk along that beach doing something so silly. 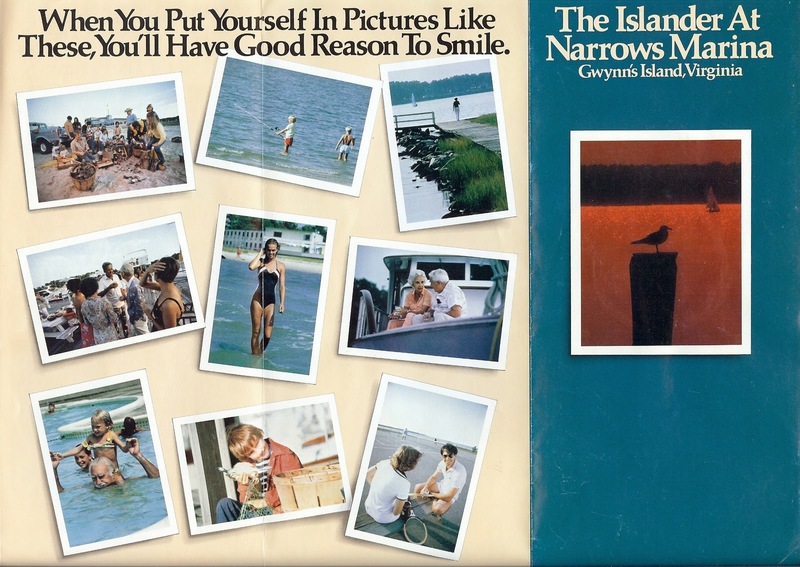 In spite of this internal debate, CBW pretended to do the this or that the man suggested, and the next thing she knew the photo of her doing the silliest thing of all was in the Islander brochure. What I remember most besides his accent and moustache was getting shots, lots of them, and bracing for what he described as "just a little pinch." Now we're together for eternity in the Islander brochure. 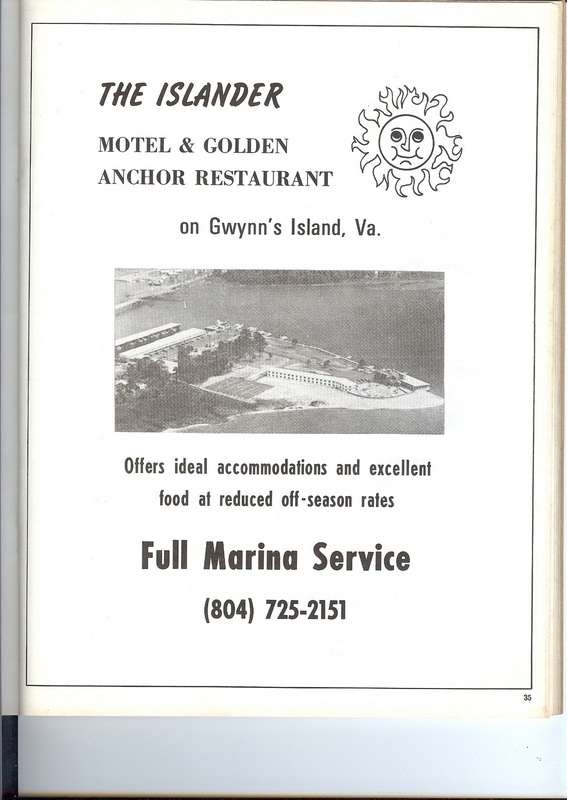 Unrelated to pretend hair tucking, rat poison, pediatricians or pinches but still related to the Islander, below is a copy of an Islander ad that ran in a 1974 Mathews High School Tidewater Shrine Club Football Classic program (try saying that three times in a row, really fast). Mathews played West Point, in case anyone was still awake wondering. My friend Bayman and I found this rummaging through an attic one hot, sweltering day. Be advised that the time of year to rummage around an unventilated attic is any time of year except summer. Be advised the time of year to take a walk down Memory Lane is any time. This concludes CBW's lesson in how to use her scanner walk down the particular cul-de-sac of Memory Lane known as the Islander.